Can an all-goalie card set exist in the hobby and have long lasting appeal? Well... of course! 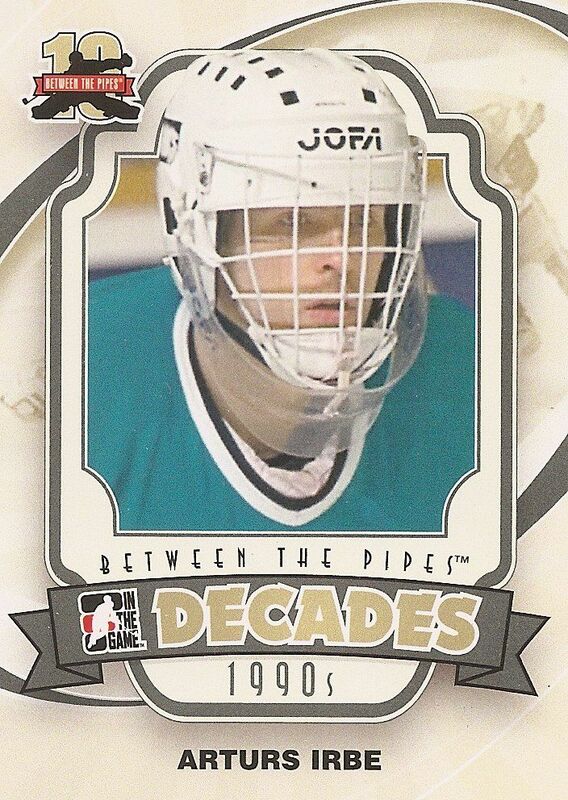 And fine folks at ITG have proven it year after year with their run of Between the Pipes cards. This set marks the 10th anniversary of BtP and it shows no signs of slowing down. If goalies are your thing, this is the obvious choice for you. 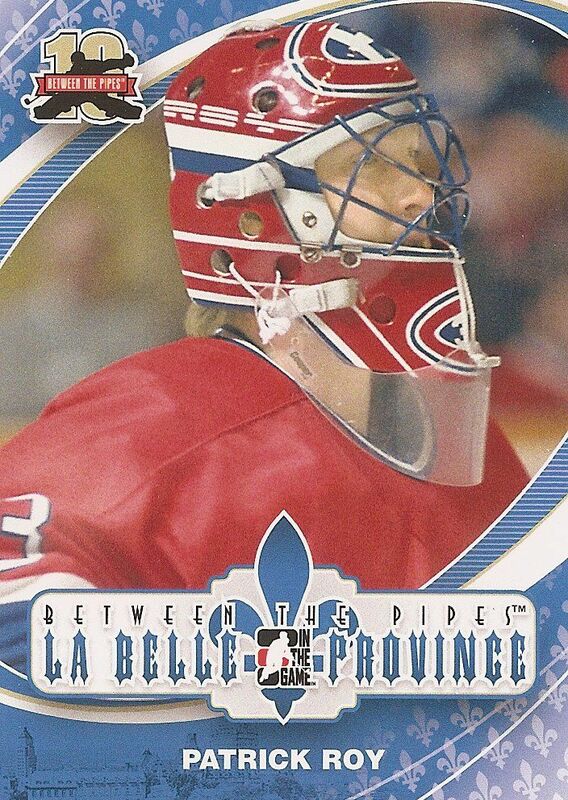 The 11/12 Between the Pipes base cards come in seven different subsets. Each subset within the main set focuses on a specific type of goalie. Though the designs of all the cards are unique to their subset, all the cards have basically the same feel. The basic card in the set is standard ITG fare - high gloss fronts with less glossy backs on standard card stock. These are not high-end base cards, but they are not meant to be. They are just right for the price point. The first type of base card are the Future Stars. Because ITG doesn't have a license, these are not considered rookie cards. 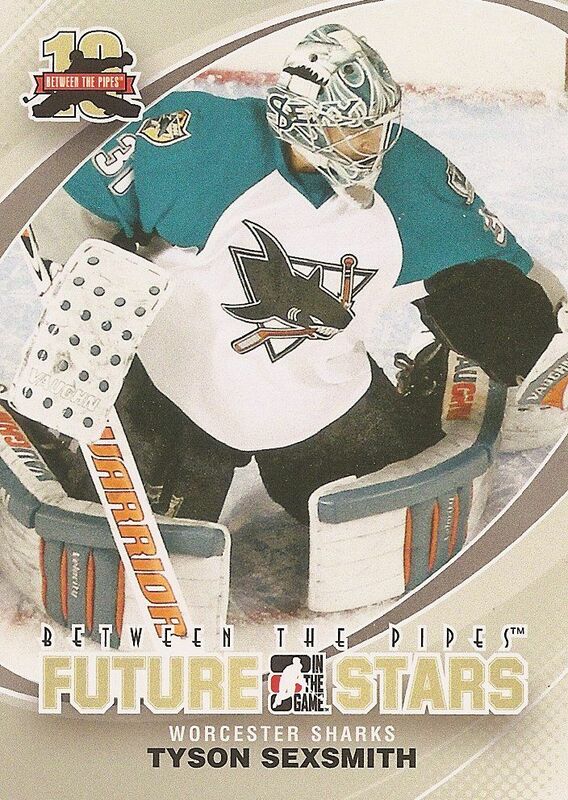 These Future Stars cards feature the youngest goaltender talent. Some of the included players are recognizable because they have cards in other brands' sets, but many are probably unknown players to most collectors. The design of the cards here is well done. I see ITG making an effort to modernize their cards a bit. The circular frame for the player photos doesn't allow for big photographs, but it does give the cards a sense of movement. The border color choice is a nice mixture of tan and muted green. There is not too much to criticize here - I am pleased with the way this subset came out. 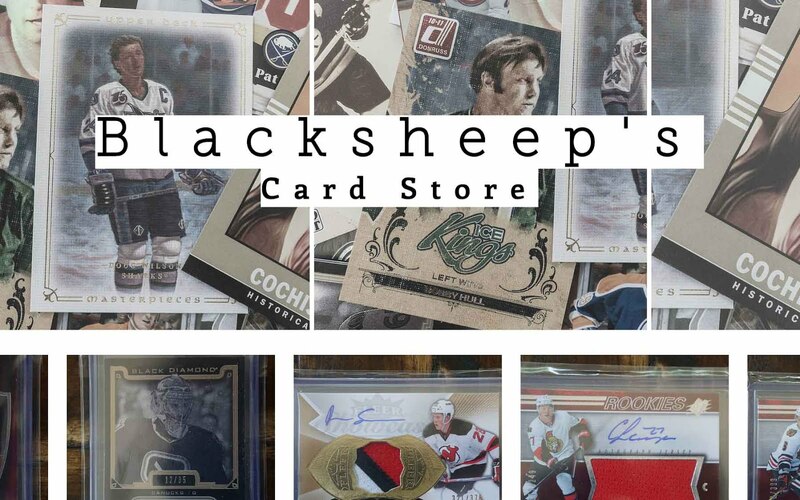 The next grouping of cards showcase the current stars of the NHL. The only difference between these and the Future Stars is the logo and border color. The current stars get a violet/light purple border. I don't like the color choice nearly as much as I did with the cards before. Not that there is anything wrong with purple or violet, but these cards remind me of the female goalie cards ITG included last year. One thing that is great about these cards though is the photography chosen. Because ITG cannot show NHL logos they had to be very careful and picky... or good with air brushing. Many of these photos are closer up shots of the player's head or mask. The up-close view is cool, and for many of the cards you can definitely tell what pro team they are playing for without any of the markings. 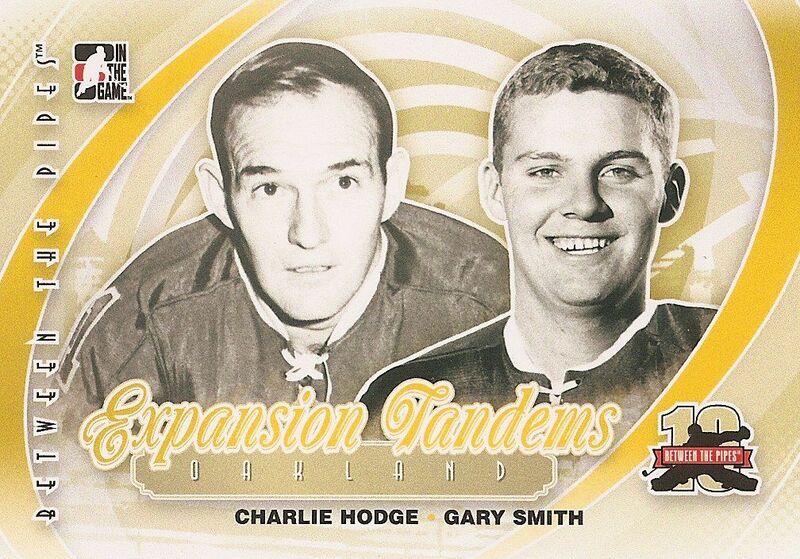 Decades cards give the nod to players of the past. ITG gives these cards a retro feel and design. I am not in love with the look of these cards but I can appreciate what ITG was trying to do here. The concept definitely wins out over the design in this case. I think this was an ingenious way of incorporating a lot of goalies from many eras rather than just calling them all 'legend' or 'heroes', but the cards feel like they have too much dead space. One nice design element that ties these cards to the rest of the base cards is the circular ring though. See how that is a theme throughout the base set? Neat, huh? BtP shows some real American spirit with the Stars and Stripes subset. These cards scream American and boldly show off the stars and the stripes along with America's colors. The bottom of the cards have a subtle picture of the Capital Building. The cards are 'in-your-face' American, but that's a good thing. This group of cards stand out very strongly within the main set of BtP. Not to be left out, Canada gets a themed subset as well called La Belle Province. This subset specifically pays homage to the province of Quebec. The cards here are not as bold as their American counterparts, but the blue and white color scheme stands out in its on way. I really enjoyed having these two country specific themed cards in this year's set. Sporting a horizontal design, the next group of cards show off a tandem of goalies who helped their new franchises get off the ground. This subset is probably my least favorite of the cards found in this year's Between the Pipes set. They remind me of older ITG designs a little too much. This is a unique idea though - one that I don't think any other company would have conjured up. Finally, the set ends with International Pioneers. As the name suggests, these players are known for their accomplishments internationally. Since the players are associated with a variety of different countries, ITG does not have a specific country theme for these cards. Instead, ITG goes with a sort of western look. Though conceptually an odd choice, the cards look good and the theme works well. These players truly were pioneers in the world of ice hockey like the cowboys of the past were pioneers of America. Yep, this does make sense! Each box of 11/12 ITG Between the Pipes should come with a minimum of 2 autograph and 2 memorabilia cards. There is the possibility of more though! I know because my box exceeded the expected allotment - never a bad thing! The Masked Men insert cards are back this year and they have never looked better. Each Masked men card comes on a deep purple foil. Now I didn't like the purple borders on some of the base cards, but the purple foil on the Masked Men cards is a pleasure to look at. The color is a deeper purple that when shined in light gives off a myriad of reds and oranges. It's a complex look that I would have never expected to see. And if that weren't enough, all the cards are die-cut to look like a '10' in celebration of the ten year BtP anniversary. The '10' cut is very minimal and seems to take as little off the card as possible. These subtle cuts show a deft hand and a refined sense of design. 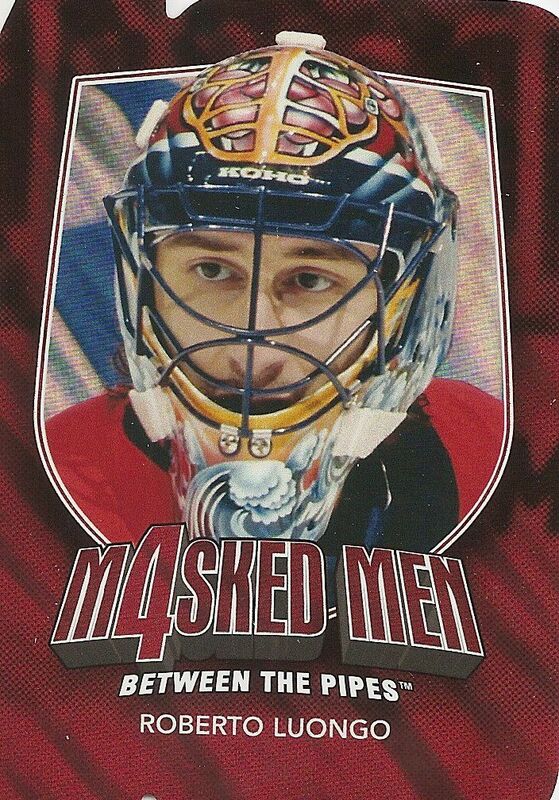 I can't say enough good things about the Masked Men cards this year. Kudos! 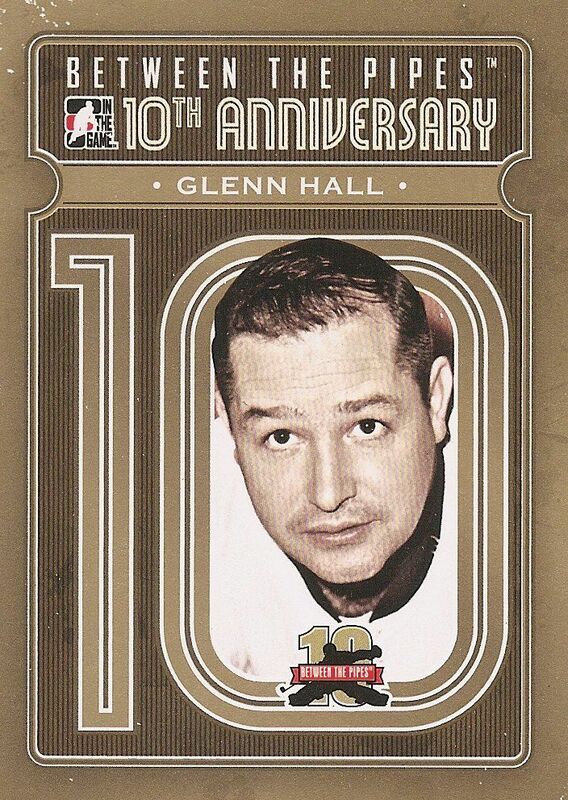 A more standard insert card found in the set this year are the 10th Anniversary cards. 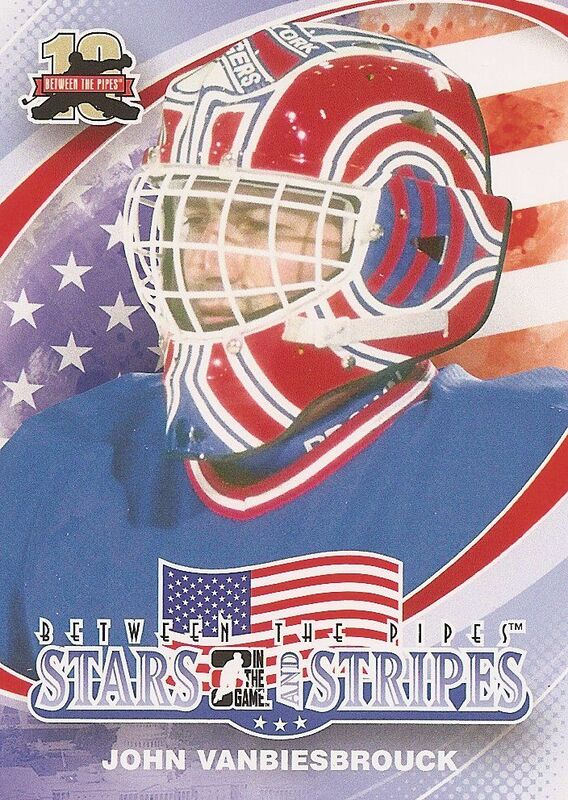 These cards are also a celebration of the 10 years that ITG has been making Between the Pipes. The cards are nicely designed and I enjoy the dull gold that ITG used on the fronts of the cards. It's a classy design reminiscent of an old movie or Academy Award type poster. In terms of game-used cards, the most basic is the standard silver level jersey card. Aside from featuring the color of the team the goalie plays for, I find that this insert is has the most generic feel of all in the set. These cards are just too similar to all the other year's silver level jersey cards. Even with slight changes in design, there's not too much to get excited about here. It'd be nice for ITG to revamp these types of cards so they have a more dynamic look and feel. The standard autographed cards also carry the standard ITG look and feel but with a twist. These cards have a design that matches up with the Decades cards from the base set. This is something different that I wish ITG would have done with the jersey cards. It's great to know what era of player my autograph card features. I happened to get an autographed card from a player who played in the 60's, 70's, and 80's. 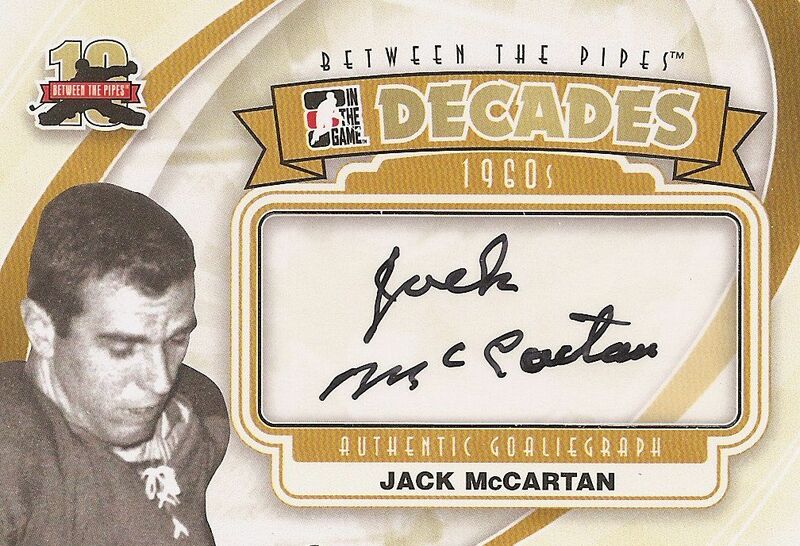 While I didn't like the look of the Decades base cards, I do really enjoy the autographs. There's enough going on with the card that it doesn't look like anything is missing or lacking. And as usual, though the cards feature sticker autographs, it really doesn't look like it. 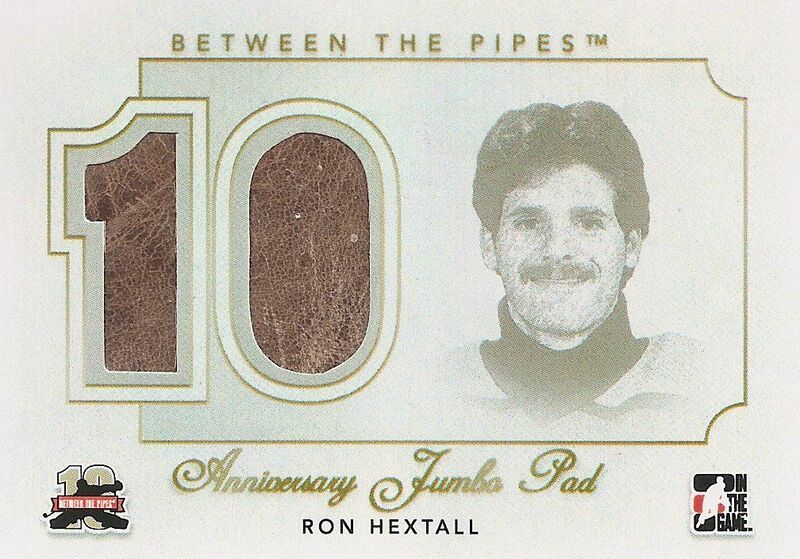 This Anniversary Jumbo Pad of Ron Hextall is the direction I wished ITG would go with all its cards. It is super clean and elegant. I absolutely love the way this card looks. The slightly textured white background allows the piece of memorabilia to stand out in a significant way. The drawn image on the card contributes to the classiness of the card. Everything about this card is flawless. The only unfortunate thing is that these cards are also some of the most limited cards in the set. The Hextall is limited to just 10 copies. And I just HAD to point this card. ITG has again put in their redemption program called He Shoots-He Saves. If you collect these cards you can redeem them for a special card from ITG. So this year the cards are puzzles that you can put together and form a large picture. 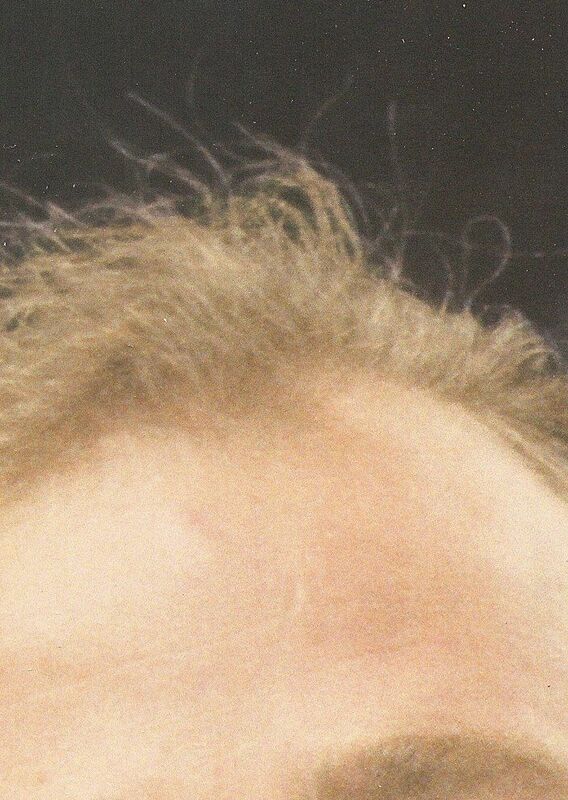 It's funny though when you get odd looking parts of the puzzle - like this forehead and hair image. Though I am not a huge goalie fan, I appreciate a set like Between the Pipes. Each year ITG releases this set and somehow they make it a little better each time out. I find that incredibly impressive. The BtP sits right in the 'just about everyone can afford' category. Boxes will run about $90-100 each. Though that's on par with many other boxes out there, keep in mind that there are 18 packs per box so per pack price will be lower than cards like Certified and Artifacts. Packs will be a tad more expensive than Upper Deck Series 1, but the odds of getting a 'hit' are better here. I have no qualms about recommending Between the Pipes to all collectors. The substantial base set is great fun to look at and read, and the hits are well-done - especially the 10th Anniversary memorabilia cards and Masked Men inserts. Congrats to ITG for a successful release! Here's to another 10 years of BtP! I like BTP. It seems to have a bit of a cult following, and by having it open for the Expo (ahem, UD, that's how it's done) they'll bring themselves a lot of publicity and, likely, a lot of money. I personally like the design on the product last year better than this year's, but I still think this is solid product that usually delivers a solid bang for your buck. This product is very nice. I very liked your break. I didn't think this product would have 3 autos, I very licked that. Also, the hextall's pads are very nice. That's a nice product and I think that the bases's design is very good. i personaly think that this years btp is an amazing product. i think it is hit or miss but when you get something good usually it is a very amazing card. the design of the cards is fanominal. thank you for another amazing review thenk you. I like the looks of this set, I don't know if I'd give it a 9/10 though, maybe a 7. Looks like retro is in style right now between Elite and the many retro cards in this set, not to mention other releases this year. Thanks for the review blacksheep! I like ITG's work, but this set ain't for me. The designs are good, the usual ITG style, but the all goalie angle is probably too niche for me. Plus I'm shying away from boxes that weigh you down with base cards, and as long as there are Captain-C boxes available for me to buy everything else will have to wait. i think between the pipes is a good product . my favourite cards is probaly the masked man cards . I am not a big fan of ITG products and especially this one because there are so many players that are not very well known. Just like all ITG products, I love between the pipes. Since I am usually interested in ALL goalie cards, this product is one of my favorites.The autos and jerseys always do not disappoint me and I love the base card designs. Overall this product is EPIC. ITG is cutting edge - I really like what they are doing in the hobby. Great review once again! I think the base is nice but not the best of BtP. I also think that the design of the Hextall pad is really really nice. Great review Luke! ITG is for real, you get a lot of value back from their cards that's is why I love ITG. 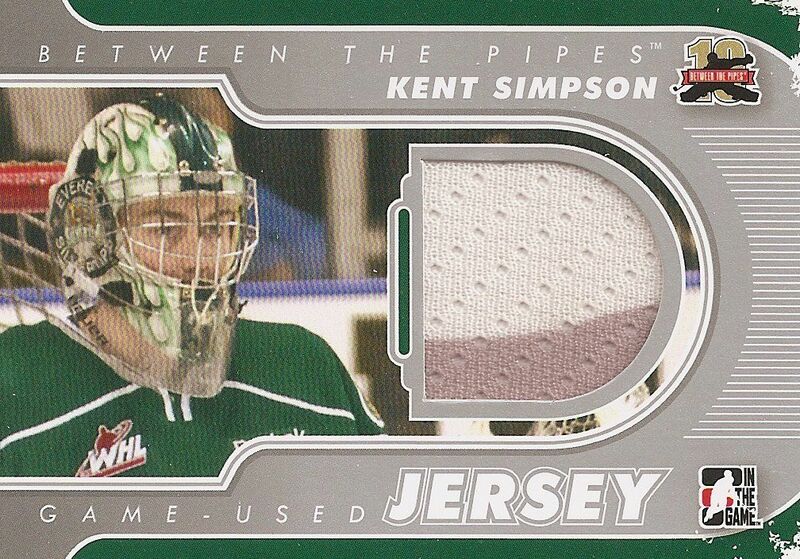 I like Between the Pipes because you get a lot of quantity of cards in the box also. Good review once again luck. I'm not a big fan of ITG and don't open much of this company but out of watching all the videos of different years of BTP i saw this years has to be the best of them all. Thanks again for the contest Luke. i like this product the fact they have junior team. i like the diecut on the masked men but i don't get why the parallels aren't. the puzzle on the decoys are cool if you have all of them but if you don't they are creepy. This is an ok product to me. There are not a big variety of hits, and there are a bunch of no name goalies. That being said, there are also a couple of nice cards to be found. Overall I'm not a big fan of ITG though. Thanks for the contest! Although I don't typically like all goalie products. This one is different and I would defiantly buy it know. 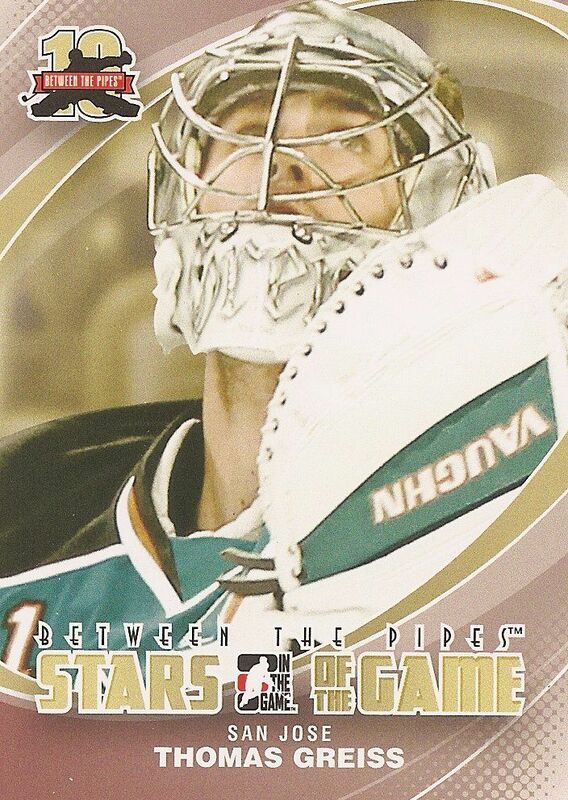 I always love between the pipes, I am a big fan of goalie cards and this is a great looking product. 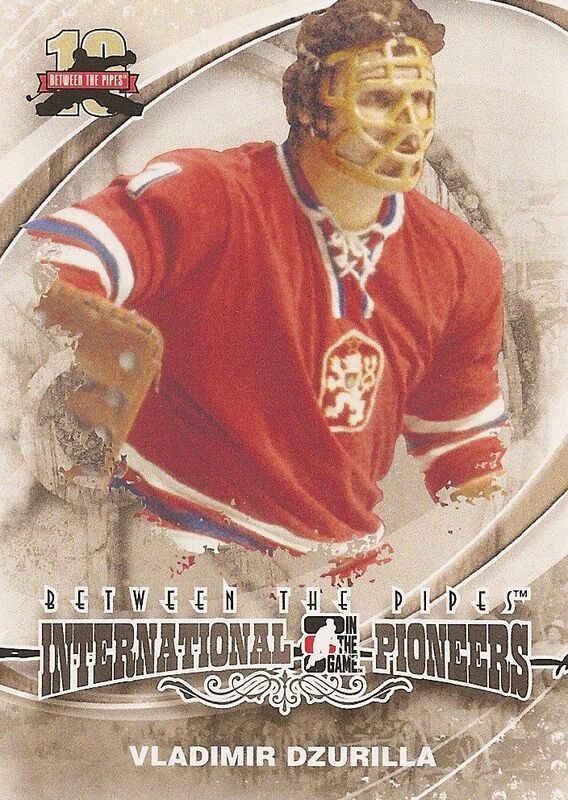 I love the masked men cards and it shows nicely the variety of goalie masks. I really like this product and would recommend it to any hockey fan. I thought BtP was a pretty solid product. I've always loved the concept of all goalies, not another product like it. Each case has a few huge hits which is always great. The Masked Men sub-set really stood out for me with the awesome refractor technology. Overall, this is a great product for all hockey fans, especially goalie fans! Thanks Luke, you're the best! I like BtP becose I love goalies. I like diecut masked mens. I'm more of a fan of goalies than players so between the pipes is a great set for me. Also I love ITG with the way they distribute memorabilia and autos. Also love the masked marvels this year! i just feel like your reviews are excellent for the small minded collectors (ME) who tend to collect very certain sets of cards... i would normally never purchase any ITG BTP but it seems tempting and the jumbo pad cards are definitely very cool. thanks again, keep the reviews coming! ITG did a really good job on between the pipes this year. Great looking design on the base, some interesting sets, but overall this is not a product for me, I dought i will be buying a box, not because I think the product is bad but because there is nothing really on the checklist that interest me to buy a box. Thanks for the contest again! i think this product would be a very fun bust and I love watching box breaks of this product! the cards look very sick. the inserts and autos and jerseys look very sick. I believe that ITG BTP is overall not a very well thought product because they're not in there NHL uniform. 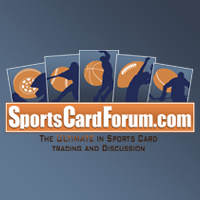 I know that ITG is not a allowed to have anything property of NHL on there cards. But think this years 11/12 ITG BTP is a lot more very creative and I actually like. I actually like it. IMO, ITG products appeal more to me , because of the simple design. I think I'm going to have to pick up a couple of boxes! LOL and I see your dislike for Roberto Luongo :P (just kidding)I believe that ITG BTP is overall not a very well thought product because they're not in there NHL uniform. I know that ITG is not a allowed to have anything property of NHL on there cards. But think this years 11/12 ITG BTP is a lot more very creative and I actually like.the cards look very sick. I thought BtP was a pretty solid product. I've always loved the concept of all goalies, not another product like it. Each case has a few huge hits which is always great. The Masked Men sub-set really stood out for me with the awesome refractor technology. Overall, this is a great product for all hockey fans, especially goalie fans. BTP is awesome. my only complaint is that ITG should really serial number the cards. It would really help add value. Thanks For all the Contests Luke! I think that beetween the pipes is a very nice product. I really love the look of the autos and I love that they put older goalie in the set. I think it's a great idea to collect the points to make a puzzle.Overall very good product. It's nice to see card sets getting like BtP use older players. 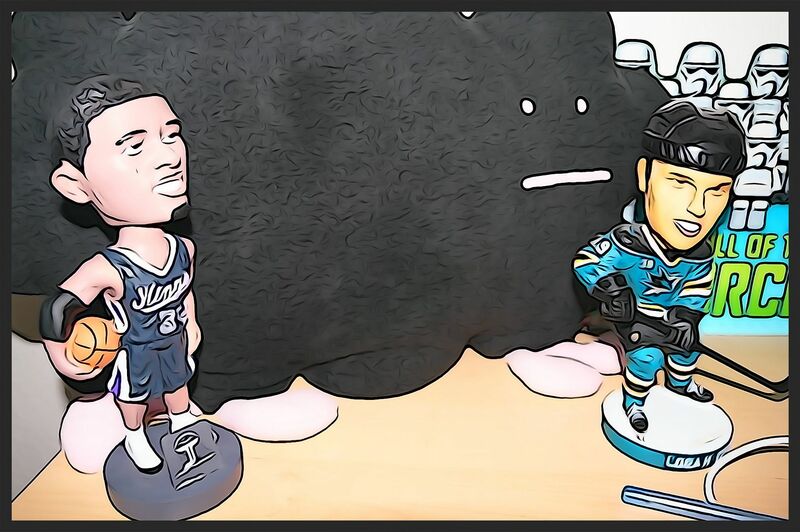 It makes it feel very nostalgic and a very good collector's item regardless of the player or the era. I have never really liked this product, but this year I like the base jerseys. ITG makes the most boring products in the history of sportscards. I mean the owner makes the cards in his basement. They have zippo hope of getting a license. Hopefully Topps can enter the market and knock them further down the curb.